Boulder proposes to right-size a portion of four streets starting in the summer of 2015: Folsom, Iris, 55th and 63rd. Right-sizing a road involves repurposing road travel lanes from car-only travel to other uses such as bicycle lanes or on-street parking. Right-sizing happens on streets that are deemed to be inefficiently and unsafely oversized. Oversized streets tend to create many negative impacts, such as cars traveling at excessive, dangerous speeds. Right-sizing creates “Complete Streets” that can be used for all forms of travel – bicycling, walking, transit, and motor vehicle travel. An enormous number of right-sizing projects have been immensely successful throughout the nation – including in cities that are rapidly growing. Despite the conventional wisdom, providing things like adding bike lanes, building new sidewalks, or improving bus service are not effective ways to effectively encourage more bicycling, walking, or transit use. The key is to reduce the space allocated to motorists, reduce the speed of motorists, reduce subsidies allocated to motorists, and shorten distances to destinations. Right-sizing achieves two of those, which makes the tactic a powerful tool to grow the number of active travelers. Boulder has previously right-sized portions of Baseline, Table Mesa, 13th Street, and North Broadway (Pearl Street downtown was actually closed to traffic to create Pearl Street Mall). In each case, there was very vocal opposition. Nevertheless, the fears expressed did not materialize, and a large jump in bicycling and walking was the result. This tracks national experience, where hundreds of right-sizing projects have succeeded. In nearly all such cases, large majorities opposed the proposal, which was followed by large majorities supporting the right-sizing AFTER they were installed. Opponents of right-sizing tend to throw around alarmist, hysterical, misleading, end-of-the-world comments about right-sizing. That the community proposes to prohibit car travel. Or force everyone to ride a bicycle. But there is an enormous difference between creating a modest delay in car travel versus prohibiting car travel. Indeed, the tactic is much more accurately described as a way to NUDGE people toward more desirable ways of traveling, rather than FORCING them to give up their car. Due to excessive speeds or insufficient space for bicycling, the four candidate roads discriminate against bicycle travel, walking, and transit users. Right-sizing therefore creates more equity. More transportation choice. Roads that are car-only are toxic to communities. Peter Swift conducted a study in Longmont CO that found that efforts to reduce fire truck response times by increasing roadway dimensions INCREASED the overall number of injuries and deaths in a community because the number of injuries and deaths associated with fires is tiny compared to the large increase in injuries and deaths caused by high speed car travel. By increasing car speeds through excessive road sizes, public safety declines. Fire safety is a subset of life safety. To reduce overall injuries and deaths in a community, therefore, suboptimizing on fire safety by speeding fire trucks is counterproductive. On the four candidate roads, there have been 419 car crashes over the past three years. This is far, far lower than the number of fires near these roads over that time period. Right-sizing therefore is a big win for reducing injuries and deaths. As an aside, it should be noted that the Boulder Fire Department is not concerned about the proposed right-sizing, largely because of the installation of a center turn lane. Right-sizing tends to be beneficial not only to bicyclists, pedestrians, and transit users. It is also beneficial to small retailers, residential homes, and overall community quality of life. There tends to be very little loss of road capacity when a road is right-sized. 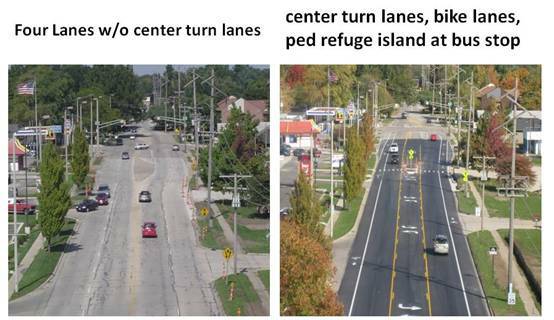 This is particularly true when a road is right-sized from four lanes to three, because the inside lanes of a four-lane street frequently are serving as left-turn lanes. When a car makes a left turn on a road without a turn-lane at an intersection, the road is essentially already functioning as a three-lane road. In addition, right-sizing reduces average car speeds. When cars are moving at slower speeds, they tend to travel closer to other cars on the street, because less stopping or slowing time is needed at lower speeds. When cars are closer together, the road lane is able to handle a larger volume of cars. Road lanes with faster car travel are able to handle smaller volumes of cars. Models used by traffic engineers tend to be unable to take into account “induced” car trips and “discouraged” car trips. Induced car trips are those trips that would not have occurred had the community not previously over-sized a road (or because the motorist is not obligated to pay a fee to use the road). Discouraged car trips are those trips that are relatively flexible. When a road becomes slower, some trips shift to non-rush hour times, or happen on alternative routes. Because traffic models – which engineers use to predict traffic volumes and congestion due to various road configurations – don’t do well in incorporating induced or discouraged trips, such models tend to exaggerate problems such as congestion. In the real world, then, problems associated with right-sizing are much less significant than predicted by engineering models. Commonly, when a right-sizing project is proposed, there are fears of “spillover” traffic on parallel routes. This fear tends to be vastly overblown due to the issues described above. A great many trips on streets are discretionary in the sense that they can happen at non-rush hour times, on alternate routes, or not at all. In other words, not all car trips are emergency trips or otherwise essential trips that must be made on that route at that time. This is a very common misconception, and creates “worst case scenario” thinking that is unsustainable . Right-sizing results in a significant increase in road safety. This is due to lower average car speeds, more attentive driving, and the inability of motorists to weave from lane to lane as they attempt to pass other cars. When there are multiple travel lanes in the same direction, the fastest car sets the pace. Safer roads invite and dramatically increase the use of the road by bicyclists, pedestrians, and transit users. Commonly, there is a fear that a right-sized road will make it more difficult to enter the road from a side street (due to cars being closer together). In fact, right-sized roads often make entering easier. This is because the entering motorist needs to cross less travel lanes when making a left turn onto the right-sized road (and wait in the left-turn lane if there is not an opening). In addition, slower car speeds on a right-sized road makes it easier to enter the right-sized road, because smaller gaps are needed to safely enter. Motorists are understandably often inconvenienced or annoyed by “flashing light” mid-block crossings for pedestrians. Because right-sizing reduces crossing distances and car speeds, such annoying crossing treatments are less necessary and therefore less used. It is common for opponents of right-sizing to claim that increased congestion from right-sizing will increase air emissions and fuel consumption. In fact, the reverse tends to be the case, because right-sizing commonly discourages trips – particularly “low value” trips such as a trip to get a cup of coffee at rush hour. To the claim that this is an unacceptable form of “social engineering,” it should be pointed out that the massive subsidies provided for the car-dependent suburban lifestyle is the most substantial form of “social engineering” in world history. Right-sizing nudges society towards a more efficient, natural state of affairs. Overall quality of life increases for neighborhoods near right-sized roads, such as reduced air emissions, reduced noise pollution, less regional car trips impacting the neighborhood, and more safety. For the first time in history, vehicle miles traveled (VMT) is leveling off and starting to decline. This trend, which many believe is long-term, means that fears of excessive congestion due to right-sizing should be lower. Right-sizing increases travel by bicyclists, pedestrians, and transit users. It reduces noise pollution, air emissions, speeding, and fuel consumption. It improves conditions for homes and retailers near the right-sized road. Right-sizing reduces the number or injuries and deaths on the road. It provides more space for landscaping, on-street parking, bicycle and pedestrian facilities, and stormwater management. Right-sizing reduces maintenance costs. All of these benefits improve the quality of life for those near the corridor and community-wide. The question of trade-offs must be asked: Is the loss* of, say, 30 seconds of your travel time more valuable than reduced injuries and deaths, the reduced air emissions, the increase in bicycle, pedestrian and transit travel, the reduced noise pollution, the improved visual quality, the improved conditions for homes and retailers, the reduced speeding, and the lower cost for local government? For nearly all of us, I don’t think so. I think the case is clear that the many large benefits of right-sizing far outweigh the relatively minor increase in travel time. The success and popularity of right-sizing throughout the nation demonstrates this quite well. * Note that right-sizing does not necessarily result in a loss of any travel time at all. For example, some motorists respond to right-sizing by avoiding rush-hour travel or opt for alternative routes.